iTunes settings for ripping audiobooks. You probably already know that there are thousands of audiobooks on the iTunes Store that can be purchased. But, if you've got some on compact disc (perhaps even some old ones gathering dust), then why buy them again? Instead, you can save money by transferring them to your iTunes library. 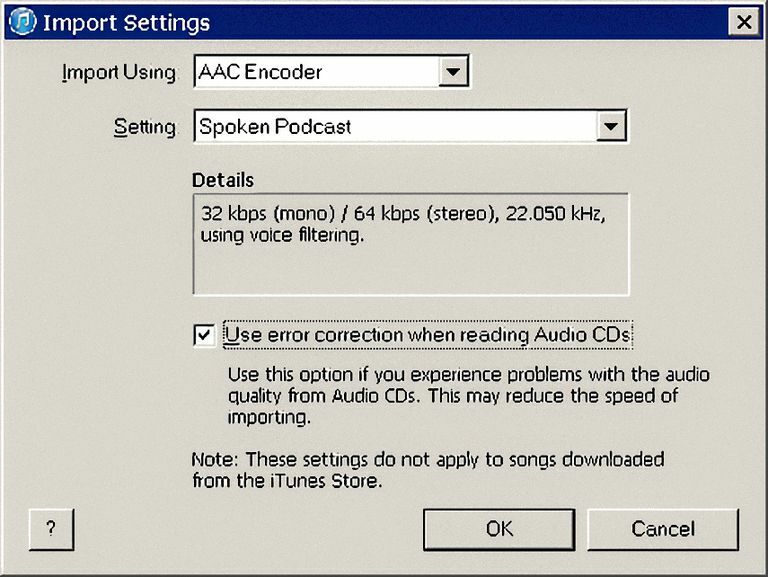 However, the default rip settings in iTunes won't be ideal for encoding the spoken word. Unfortunately, iTunes can't tell the difference between an audiobook and a music CD. It, therefore, doesn't automatically adjust these settings to optimize encoding for voice. To get optimal audio quality and file size when transferring audiobooks you'll need to manually change these settings. By default, the iTunes Plus Format is used. This encodes audio at a sample rate of 44.1 Khz with either a bitrate of 256 Kbps for stereo or 128 Kbps for mono. However, this setting is more suitable for music which typically contains a complex mix of frequencies. Most audiobooks are predominantly voice so using iTunes Plus tends to be overkill -- unless space isn't an issue. Instead, there is a much better option in iTunes which is more geared towards the spoken word. It uses a lower bitrate/sample rate and employs voice filtering algorithms. By using this rip preset you will not only produce digital audio files that are optimized for audiobook playback, but they will also be significantly smaller than if using the default rip setting. Click the Edit menu tab at the top of the iTunes screen and select the Preferences option. Click the General menu tab if not already selected. Locate the CD Import Settings section (about three-quarters of the way down the screen). Check that the option, Ask to Import a CD, is selected. Ensure that the option, Automatically retrieve CD track names from the Internet, is also enabled. Click the Import Setting button. Check that the AAC Encoder is in use, if not then click the drop-down menu to select it. Click the Settings drop-down menu and choose the Spoken Podcast option. This is ideal for audiobooks which are mostly voice. It uses half the sample rate of iTunes Plus (i.e. 22.05 Khz instead of 44.1 Khz) and either a bitrate of 64 Kbps for stereo or 32 Kbps for mono. Finally, check that the Use error correction when reading Audio CDs in enabled. Click OK > OK to save. If the Spoken Podcast preset doesn't produce the quality of audio that you are looking for, then consider using the Custom option in step 8. This enables you to fine-tune the values for stereo bitrate, sample rate, etc. If you do decide to use this option then ensure you enable the Optimize For Voice setting. If you want your audiobooks to play on non-Apple devices then it may be best to choose the MP3 encoder (step 7) instead. As a guideline set the sample rate at 22 Khz and experiment with a low bitrate (using VBR). Try 64 Kbps first to see how it sounds -- you might be able to reduce this a little if the voice sounds clear. Do You Know How to Convert MP3s into an Audiobook?